Back at home Jake did some simulations on random walks in one dimension (in which you just go forward or backward with equal probability) and sent them to me. Next, I did the same with hexagonal random walks (code at the end of this post). 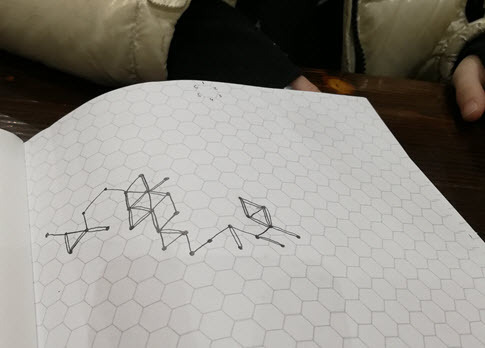 Here’s an image of one random walk on a hexagonal field. 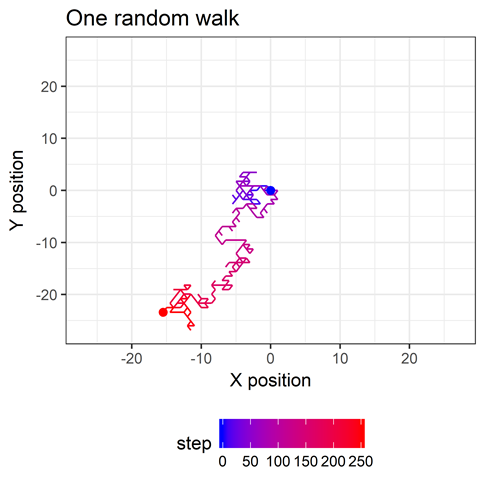 I simulated 5000 random walks of 250 steps, starting at the point 0,0. 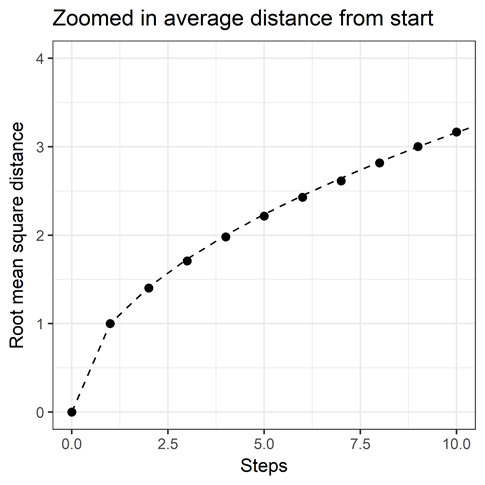 The average X and Y position is 0 at each step, as shown here. This might seem strange at first. But think about many walks of just one step. 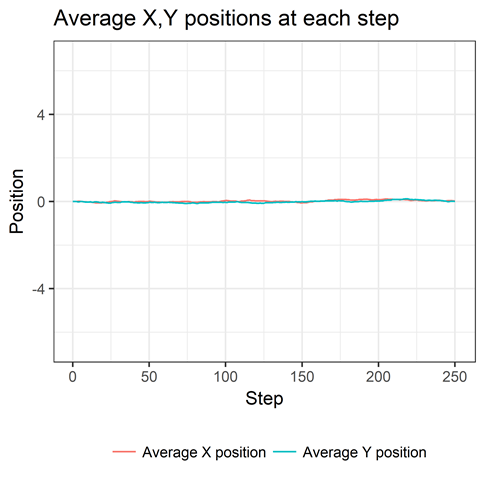 The number of one-step journeys in which your X position is increased a certain amount will be matched, in expectation, by an equal number of one-step journeys in which your X position is decreased by the same amount. Your average X position is thus 0 at the first step. Same is true for Y. The logic scales when you take two or more steps and that’s why we see the flat lines we do. If you think about this wrongheadedly you’d think you weren’t getting anywhere. But of course you are. 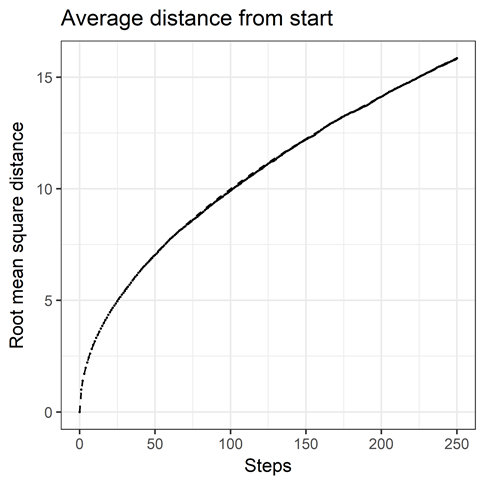 Let’s look at your average distance from the starting point at each step (below). The longer you walk, the more distant from the starting point you tend to be. Because distances are positive, the average of those distances is positive. We say you “tend to” move away from the origin at each step, because that is what happens on average over many trips. At any given step on any given trip, you could move towards or away from the starting point with equal probability. This is deep stuff. Speaking of deep stuff, you might notice that the relationship is pretty. Let’s zoom in. (*) As a sidenote, I was at first seeing something that grew more slowly than the square root and couldn’t figure out what the relationship was. It turns out that the square root relationship holds for the root mean squared distance (the mean of the squared distances) and I had been looking at the mean Euclidean distance. It’s a useful reminder that the term “average” has quite a few definitions. “Average” is a useful term for getting the gist across, but can lead to some confusion. Speaking of gists, here’s the R code. Thanks to @hadleywickham for creating the tidyverse and making everything awesome. Random walking was written on December 11, 2017 and filed in Encyclopedia,Ideas,R.